Virtual Apparitions explores the transfer of identity through networks by examining the physical manifestation of virtual bodies using platforms that support congenial, friendly, romantic, or intimate relationships over long distances. Virtual bodies, including avatars, social media profiles, or video platforms, do not relay intimacy or subtle social cues; however, as technology advances, the gaps between the corporeal and virtual continue to diminish. 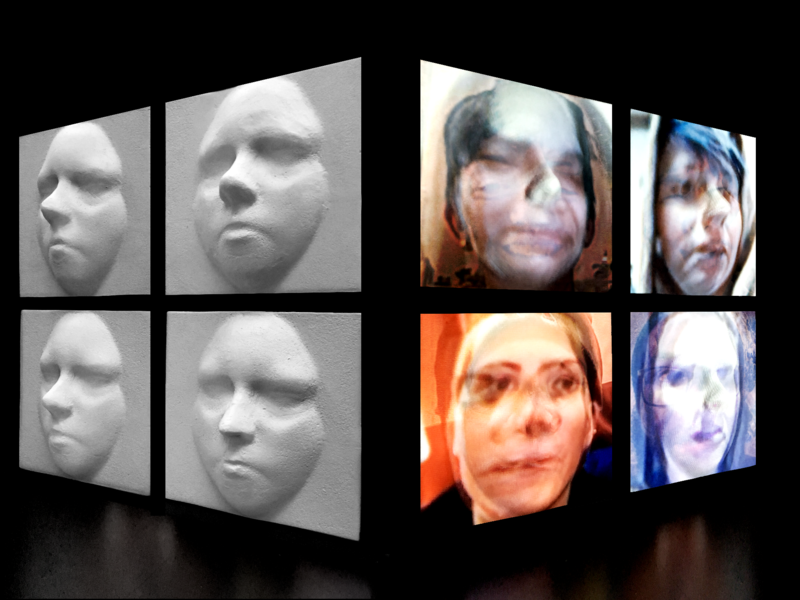 The work visualizes the extended social network as a physical presence through the use of video, sound, and sculpture. In the cacophony of voices, presence is indeterminable, focus is scattered, and the network pulses with artificial liveliness. Colleen Jennings is a multidisciplinary artist whose work focuses on emerging relationships between technology and visual culture. Virtual Apparitions is the culmination of the artist’s growing interaction with social media platforms that enable and encourage long distance relationships through visual manifestations of virtual bodies.